Click here to obtain customized driving directions. From Philadelphia Area exit @ 202 South (West Chester); continue on 202 South to Paoli Pike exit (1st of 5 West Chester exits); a landmark here is the West Goshen/KMart Shopping Center. Paoli Pike West will merge with Route 3 West which will then become Gay Street. You will come to an island at the intersection of Matlack and Gay Streets. Stay to the left of the island and at next intersection, Walnut Street, turn right (you will see Post Office and Rite Aid Drug Store.) Approximately 1/2 block on left is the parking garage. Park in garage and return to Gay street. The intersection after Walnut Street is High Street. CCBA is the 4th business on the right hand side of Gay Street after you cross High Street. Exit Route 322 West (West Chester). Stay on Route 322 West until it temporarily merges with Route One South (left turn) and then quickly turns right and merges with Route 202 North. Continue on Route 202 North into West Chester Business District. This will become High Street. 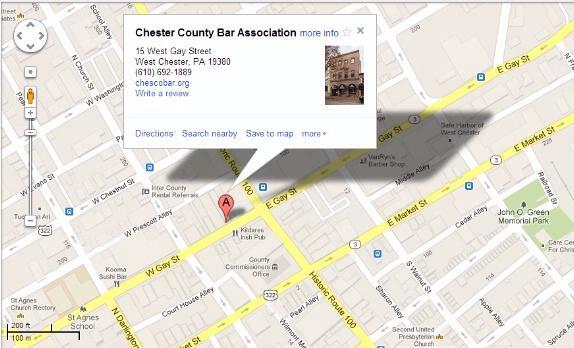 At the intersection of High and Gay Streets, turn left and CCBA is 4th business on right hand side. From Philadelphia area follow Route 3 West into Upper Darby (69th Street area) and continue out beyond Newtown Square. You will pass Route 252, Providence Road, Route 352 and Route 202 overpass, Route 3 becomes Gay Street. You will come to an island at the intersection of Gay and Matlack Streets. Stay to the left of the island. At the next intersection, Walnut Street, (you will see the Post Office and Rite Aid Drug Store) turn right. Approximately 1/2 block on the left is a parking garage. Park in garage and return to Gay Street. The intersection after Walnut is High Street. CCBA is the 4th business on the right hand side of Gay Street following the intersection of High. From Harrisburg area exit turnpike @ Exit 23 (Downingtown). After leaving toll booth bear to the left and follow signs for Rte. 100 South - West Chester. You will pass 10-12 traffic lights before coming to a major cross road (RTE.30) in Exton. Continue on Rte. 100 South, but watch for signs alerting you to Rte 100 South, West Chester, where you will exit off to the right. Rte.100 will also be called High Street. Follow this almost into the center of West Chester. Make a left turn on Washington Street, and proceed one block to Walnut Street. Make another right 1 block to the Parking Garage at Walnut & Chestnut Streets. When exiting the parking garage you will walk one block to High and Gay Streets. CCBA is the 4th business on the right hand side of Gay Street following that intersection. Parking is available in several locations. There are metered spots in the front of the building and throughout West Chester. West Chester also provides three parking garages which you can find by following the blue and yellow "P" parking signs.